Introduction: A few years ago I was part of a team commissioned to investigate the Chateau of Mayenne. This castle clasps a granite outcrop and dominates an important crossing and route-way between Normandy and Maine. The castle was of strategic importance to Duke William of Normandy who captured it after bombarding the defenders with rotting animal carcasses. As we excavated, the local mayor of Mayenne was well aware of another, less obnoxious Norman tradition: their fondness for strip cartoons. He commissioned a bande desinée to tell the story in pictures of Mayenne and our spectacular discoveries. The result was entertaining and educational propaganda: Mayenne was placed at the centre of French history, yet demonstrated itself as a model of European co-operation Those who lived in Mayenne could be proud of their town; those who did not should pay it a visit. 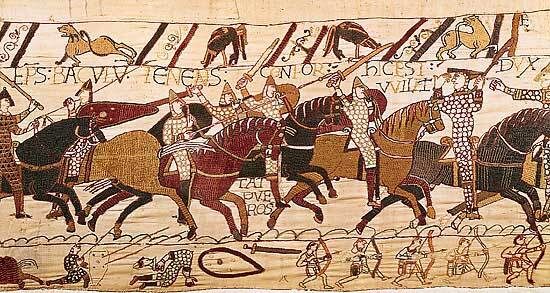 The grand-daddy of all strip-cartoons, the Bayeux Tapestry, was made over 900 years earlier. It is a remarkable survival, that was recorded in 1476 in the Inventory of Notre Dame Cathedral in Bayeux as: ‘a very long and very narrow strip of linen, embroidered with figures and inscriptions representing the Conquest of England, which is hung round the nave of the church on the Feast of Relias’. The Tapestry (or, more accurately, embroidery) has been subject to scholarly scrutiny for a couple of hundred years, so one might be excused for believing that the last word had been uttered and that we know all about it. Not so – Bayeux Tapestry scholars seem to reinvent the object of their desire almost every decade. But the answers to their questions remain elusive. Who commissioned the tapestry? Who made it, where and when? Where was the Tapestry first displayed? Was the message of the Tapestry outright Norman propaganda or a more evenhanded attempt at Anglo-Norman reconciliation? Even that great English myth, supposedly familiar to all schoolchildren, King Harold’s arrow in the eye, remains a matter of debate.